Quality begins at the quoting process and continues throughout engineering and manufacturing to assure that customer requirements are meticulously met. Quality, however, does not end in our processes or equipment, it permeates throughout our business. We use only the highest quality tooling & materials and have a sustained a quantifiable quality rating of 98% with all of our customers. 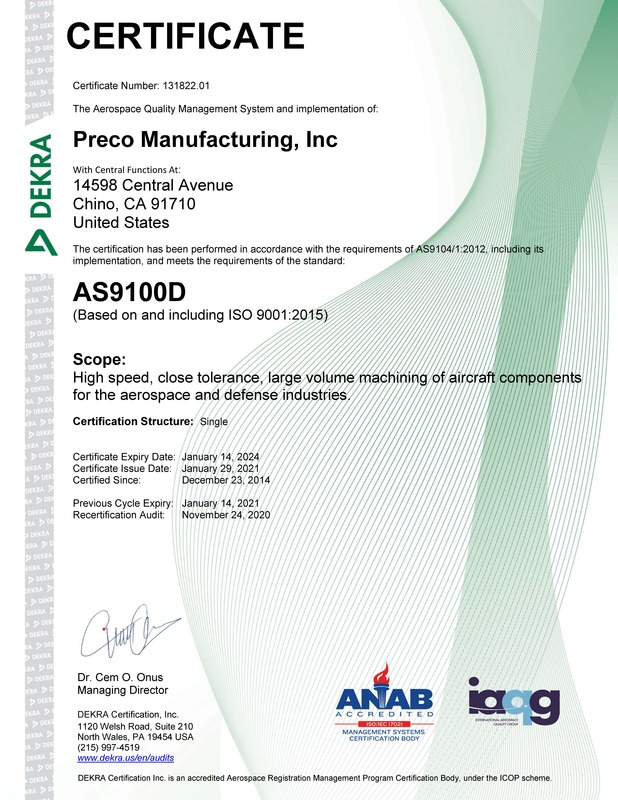 At Preco we seek to become the premier supplier to every customer we serve, whether it is in the aerospace, commercial or industrial sector. Whenever possible, we strive to machine parts completely, drill, tap and inspect in a single setup to ensure higher accuracies and a smoother production. With our expeditious and controlled manufacturing processes, we deliver products that consistently exceed our customers’ expectations on quality and affordability.